The Women of Walpole, a service club, will present nationally renowned black bear expert Ben Kilham for a multimedia presentation at the Walpole Town Hall, October 28th at 7:00 PM. This lecture is a major fundraising event that will benefit Walpole worthy causes. Tickets may be purchased beginning Oct.1st from W.O.W. members or at the Galloway Real Estate office in Walpole. Tickets are $15 for adults, and all children under 12 who are accompanied by an adult are free. Tickets may also be purchased at the door of the Town Hall on Oct. 28th. There will be a question and answer period following the presentation, and refreshments will be served. Black bears, thought to be solitary, have a different type of social behavior that possibly parallels early human behavior. They show evidence of reciprocal altruism, matrilinear hierarchy, and a mix of intentional and emotional communication. Bears can live for as many as forty years, which allows them long-term benefits from forming relationships with fellow cooperators. Ben Kilham, Ph.D is a wildlife biologist based in Lyme, New Hampshire. His love of and devotion to black bears has enabled him to study their habits and interact with them for more than two decades. He, his wife Debra and sister Phoebe have accepted orphaned bear cubs into their home and enabled them to successfully return to the wild. Ben has been the focus of several news articles and documentaries, including National Geographic’s A Man Among Bears and Animal Planet’s Papa Bear. 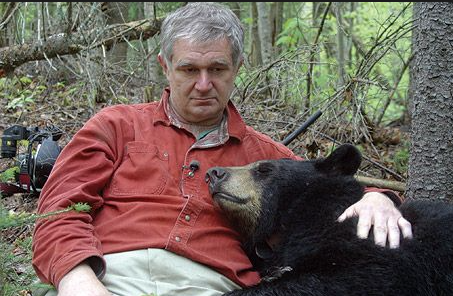 He is also author of the books Among the Bears: Raising Orphaned Cubs in the Wild and Out on a Limb: Origins of Intuition and Intelligence. As residents of rural New Hampshire, many have his or her own bear visitor or bear sighting story. This event will not only educate the audience about these bear neighbors, but will provide funds for worthy Walpole causes.